Nigerian cuisine consists of dishes or food items from the hundreds of ethnic groups that comprise Nigeria. Like other West African cuisines, it uses spices and herbs with palm or groundnut oil to create deeply flavoured sauces and soups. Nigerian feasts are colourful and lavish, while aromatic market and roadside snacks cooked on barbecues or fried in oil are plentiful and varied. Jollof rice, also called Benachin (Wolof: “one pot”), is a one-pot rice dish popular in many West African countries. The dish consists of rice, tomatoes and tomato paste, onions, salt, spices (such as nutmeg, ginger, Scotch bonnet, and cumin) and chili peppers; optional ingredients can be added such as vegetables, meats, or fish. Due to the tomato paste and palm oil, the dish is always red in colour. 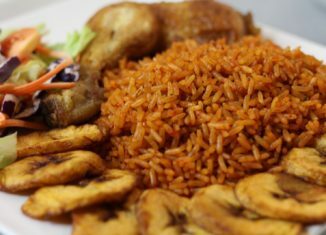 Although considerable variation exists, the basic profile for Nigerian jollof rice includes long grain parboiled rice, tomatoes and tomato paste, pepper, vegetable oil, onions and stock cubes. Most of the ingredients are cooked in one pot, of which a fried tomato and pepper puree characteristically forms the base. Rice is then added and left to cook in the liquid. The dish is then served with the protein of choice and very often with fried plantains, moi moi, steamed vegetables, coleslaw, salad, etc. In the riverine areas of Nigeria where seafood is the main source of protein, seafood often takes the place of chicken or meat as the protein of choice. Garri (also known as gari, garry, gali, “cassava flakes” or occasionally tapioca) is a popular West African food made from cassava tubers. The spelling ‘garri’ is mainly used in Cameroon, Nigeria, Sierra Leone, Benin, Togo and ‘gari’ in Ghana. Flour food stuff mixed with water used to be the major diet in the Hausa lands and almost all parts of Nigeria for many centuries. This was used by travellers in particular, who were often unable to carry cooked meals. Traveling on horseback on donkeys and trekking takes very long time and required ready fast food. Akara is a dish made from peeled beans formed into a ball and then deep-fried in dendê (palm oil). It is found in West African and Brazilian cuisines. Akara is made with cooked and mashed black eyed peas seasoned with salt and chopped onions molded into the shape of a large scone and deep-fried in palm oil in a wok-like pan in front of the customers. It is served split in half and stuffed with vatapá and caruru – spicy pastes made from shrimp, ground cashews, palm oil and other ingredients. A vegetarian version is typically served with hot peppers and green tomatoes. Acarajé can also come in a second form called abara, where the ingredients are boiled instead of deep fried. 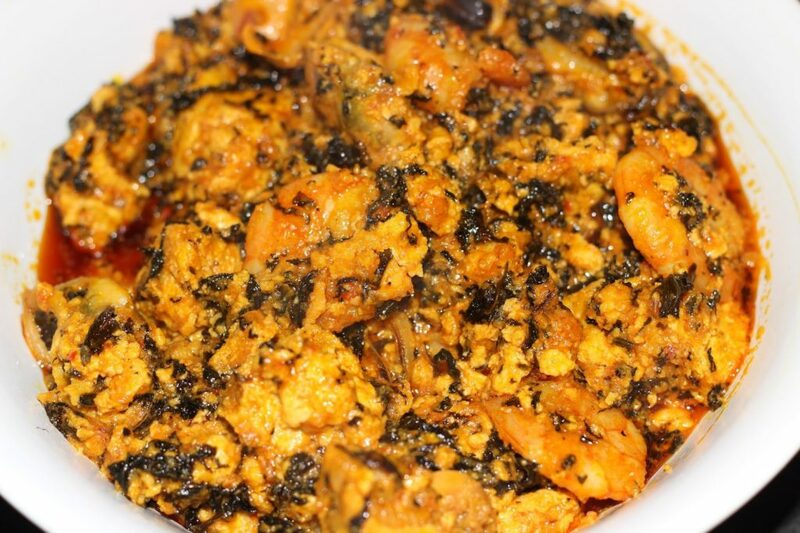 Ewa Aganyin is a street food commonly eaten in Lagos and other southern states of Nigeria. The beans are made to be extremely soft or mashed. It is commonly eaten with barely ground pepper and tomato sauce which is very spicy but peppery. It has a local name of ‘Ewa G’. Additional ingredients can include palm oil, onion and crayfish. It is commonly eaten with bread which makes it very satisfying. 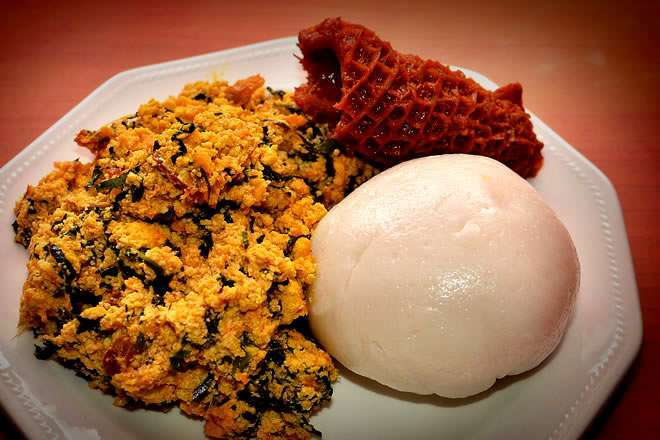 A common slang phrases is “ewa G go block belle”, meaning ewa aganyin will fill your stomach. 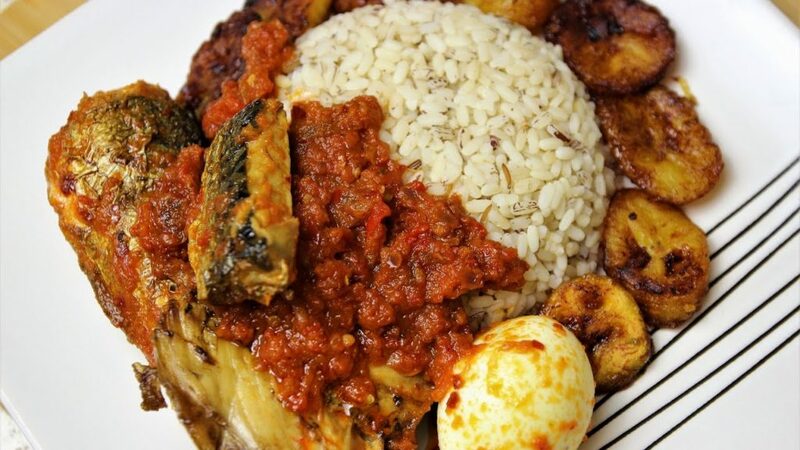 It is a popular food for Nigerians as it is both delicious and very filling. It’s simply stewed okra soup with mixed meats (beef, chicken, shrimps – whatevery you want!). 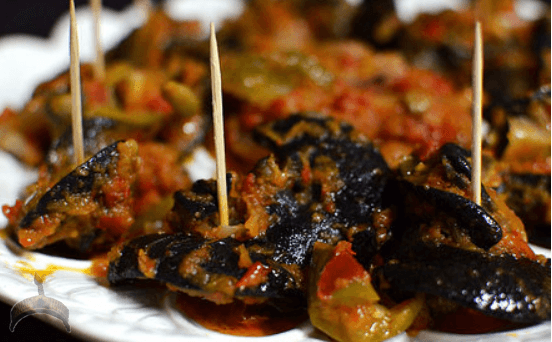 It is a very popular delicacy among the Yoruba ethnic group of western Nigeria. Suya is a spicy shish kebab (skewered meat) which is a popular food item in West Africa. It is traditionally prepared by the Hausa people of northern Nigeria, Cameroon, Niger, Ghana and some parts of Sudan (where it is called agashe). 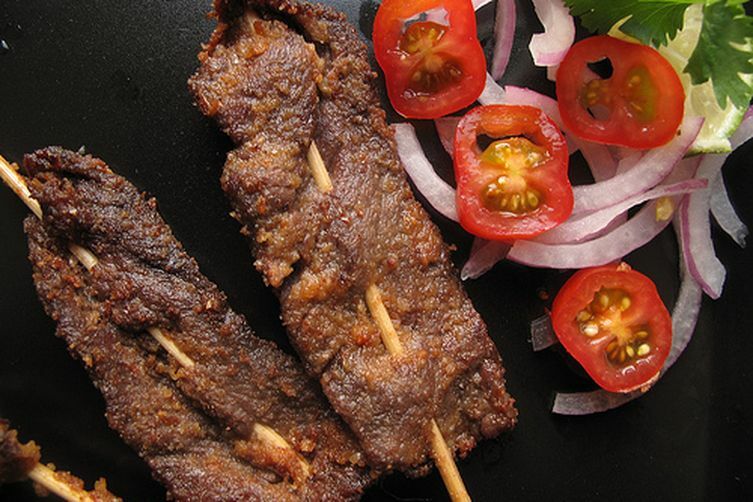 Suya is generally made with skewered beef, ram, or chicken. Innards such as kidney, liver and tripe are also used. The thinly sliced meat is marinated in various spices which include peanut cake, salt, vegetable oil and other flavorings, and then barbecued.Suya is served with further helpings of dried pepper mixed with spices and sliced onions. 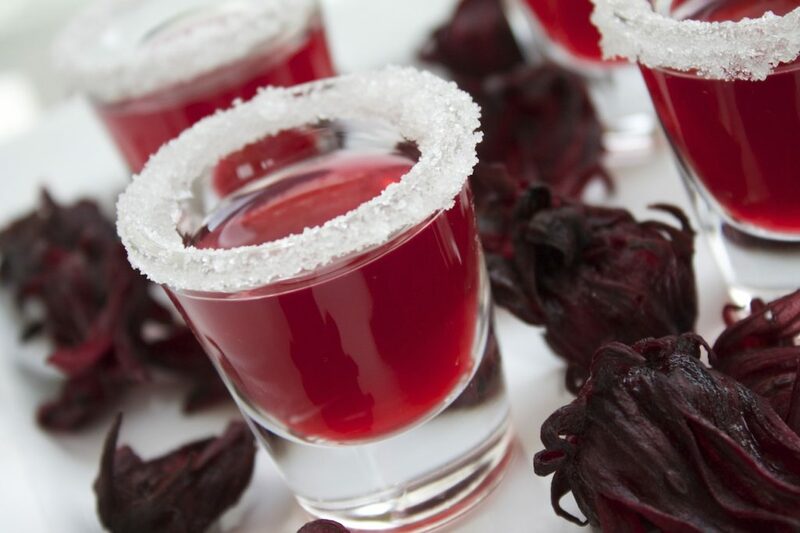 Zobo is a drink made of roselle juice. Ẹ̀fọ́ riro is a Yorùbá cuisine prepared with vegetables and stockfish, palm oil, crayfish, pepper, locust bean and may also include meat and other ingredients. 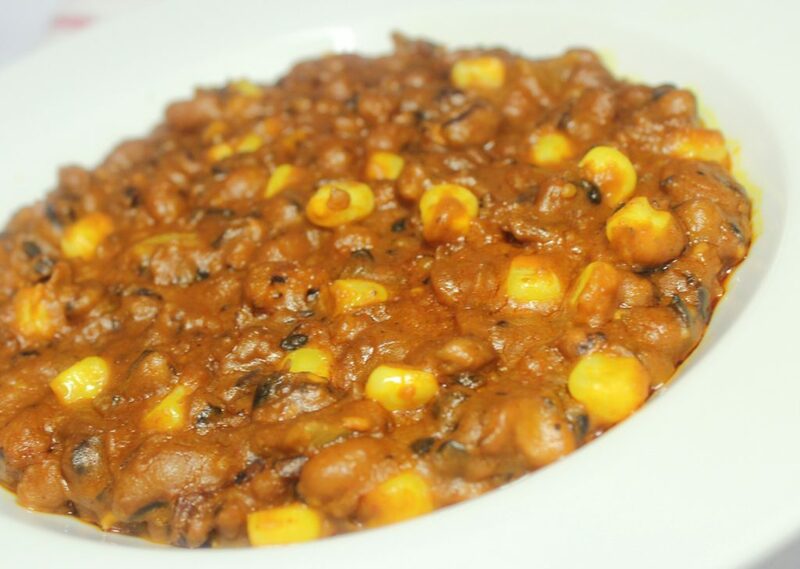 Tuwo shinkafa is a type of Nigerian dish from the northern part of Nigeria. 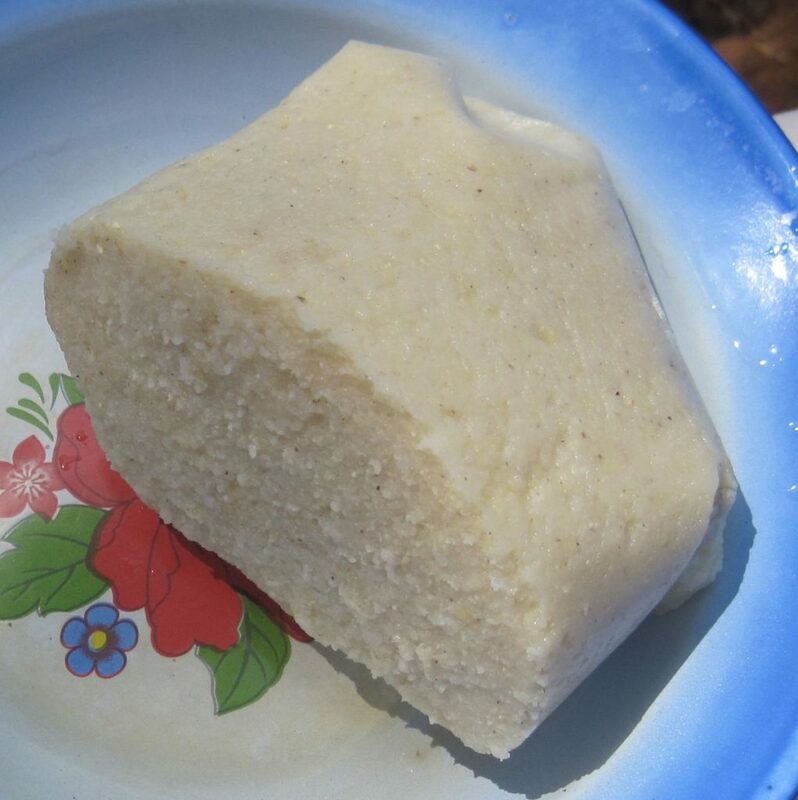 It is a thick pudding prepared from rice flour and is usually served with different types of soups like Miyan kuka. 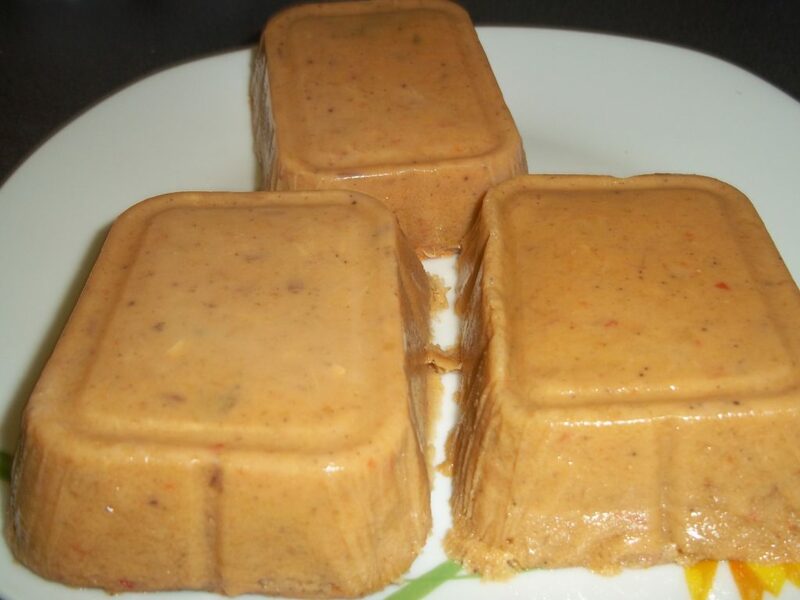 Moimoi or Moin-Moin is a Nigerian steamed bean pudding made from a mixture of washed and peeled black-eyed peas, onions and fresh ground peppers (usually a combination of bell peppers and chili or Scotch bonnet). It is a protein-rich food that is a staple in Nigeria. Some adaptations also put apples in MoiMoi. Afang Soup is a vegetable soup served at homes and also sometimes at ceremonies such as weddings, burials, festivals etc mostly in the southern part of Nigeria. Afang soup is very nutritious and cost of preparation can be adaptable based on family needs. 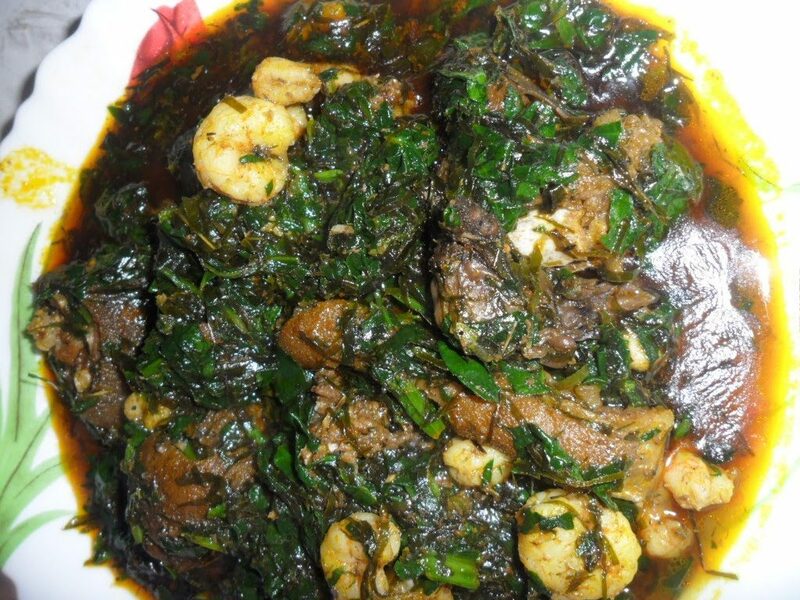 Ingredients used to prepare Afang includes beef, fish, palm oil, crayfish, pepper, Shaki (beef tripe), waterleaf,okazi leaf, onion, periwinkle salt and some other seasonings. Cooked cow legs smothered in a thick, spicy sauce; a classic dish originating from the southeast of Nigeria. Ofada rice is a name for heritage varieties of rice grown in south-west Nigeria. It is used in a variety of dishes. Ofada rices are mostly blends, and some of the rice varieties in the blends are not indigenous to Africa; however, they usually also contain African rice. 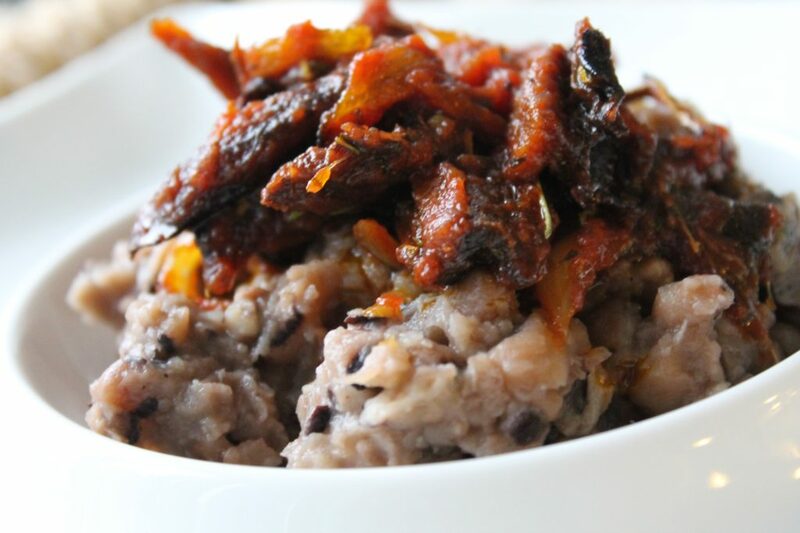 Nigerian Beans and sweet corn Porridge (Adalu) is a delicious traditional Nigerian food. Egusi soup is a kind of soup thickened with the ground seeds and popular in West Africa, with considerable local variation Besides the seeds, water, and oil, egusi soup typically contains leaf vegetables, other vegetables, seasonings, and meat. 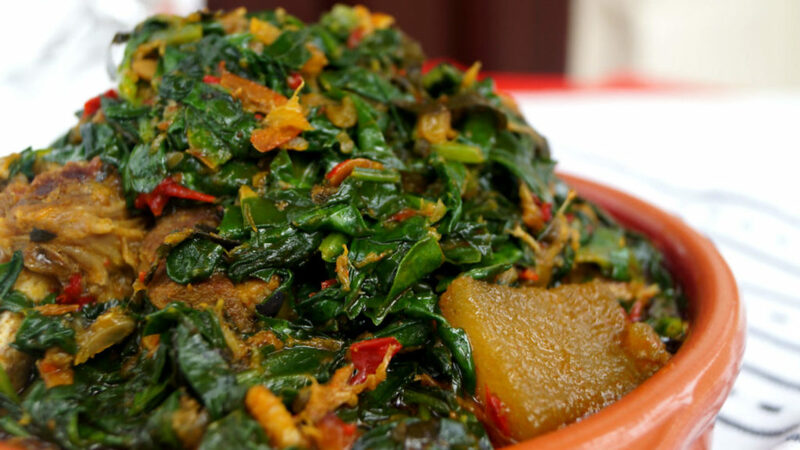 Leaf vegetables typically used for egusi soup include bitterleaf, celosia and spinach. Typical other vegetables include tomatoes and okra. Typical seasonings include chili peppers, onions, and locust beans. Also commonly used are beef, goat, fish, shrimps, or crayfish. Edikang Ikong is a vegetable soup that originated among the Efik- Ibibio people of Akwa Ibom State and Cross River State in southeastern Nigeria. 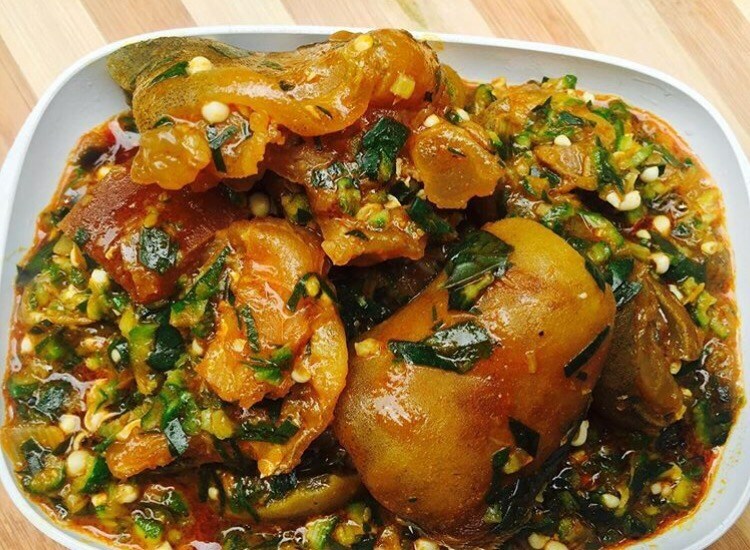 It is considered to be a delicacy among some Nigerians, and is sometimes served during occasions of importance. Edikang Ikong is a very nutritious soup and is expensive to prepare, and has been described as being mostly eaten by rich people in Nigeria. 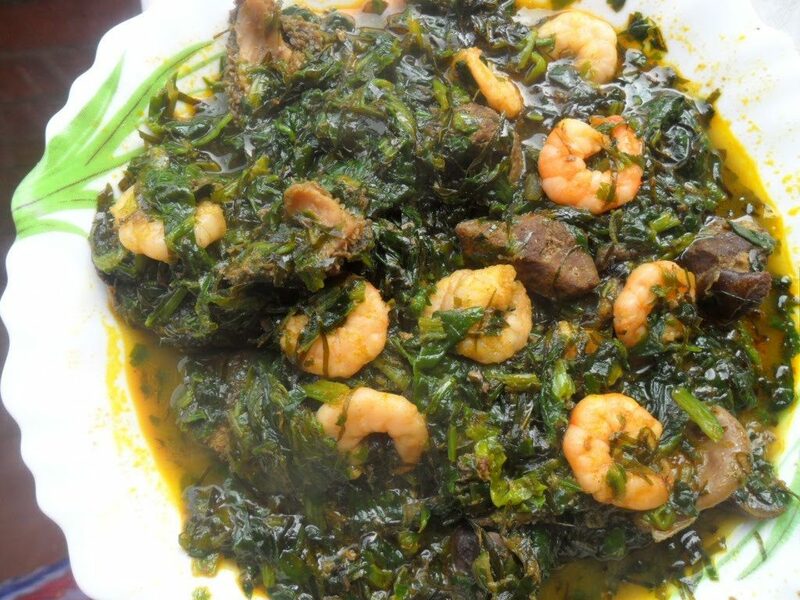 Ingredients used in Edikang Ikong include beef and dried fish, bush meat, crayfish, shaki (beef tripe), kanda, pumpkin leaves, water leaves, ugu, onion, periwinkle, palm oil, salt and pepp. Ekpang nkukwoEkpang Nkukwo is one of the traditional delicacies of the Efiks and Ibibios. 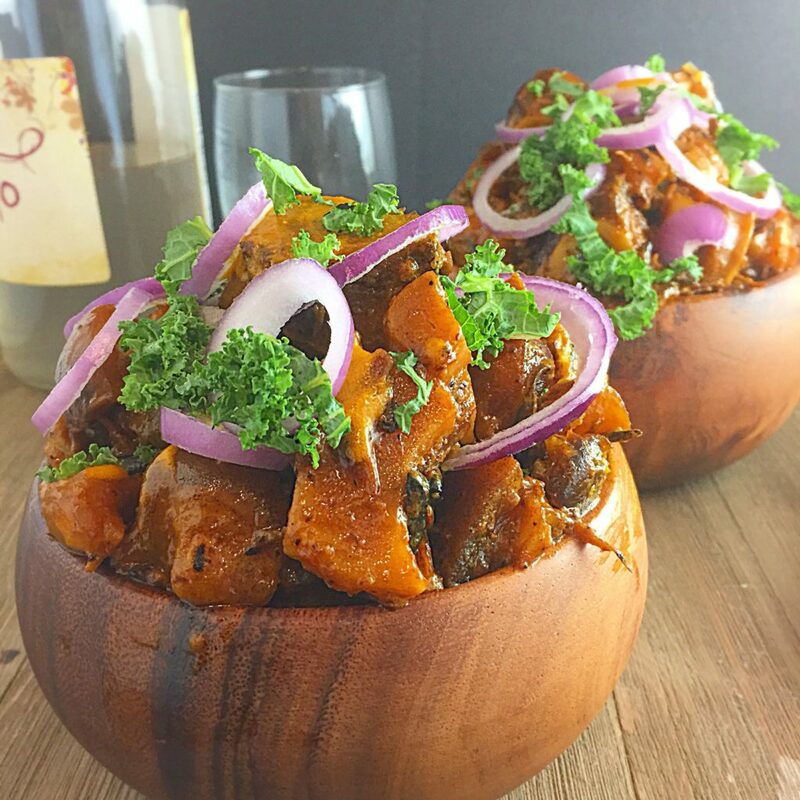 Made with cocoyam and little wateryam, this meal is relished by many and contains the basic classes of food, the flavour and taste are heavenly mouth-watering. 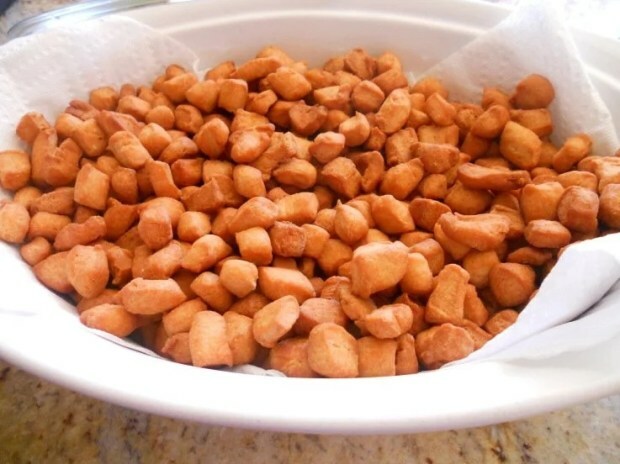 Puff-puff as it is called in Nigeria and in Sierra Leone, bofrot in Ghana, mikate in Congo, Beinye in Cameroon, or kala in Liberia is a traditional African snack. 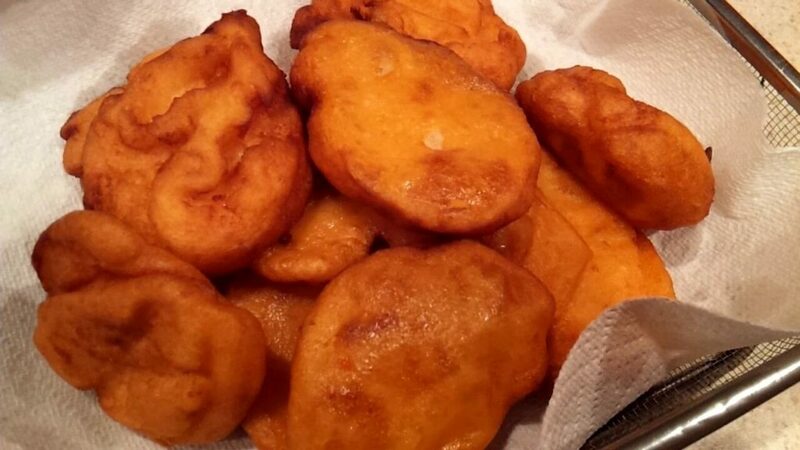 There exists a similar version known as mandazi in Eastern and Southern Africa. 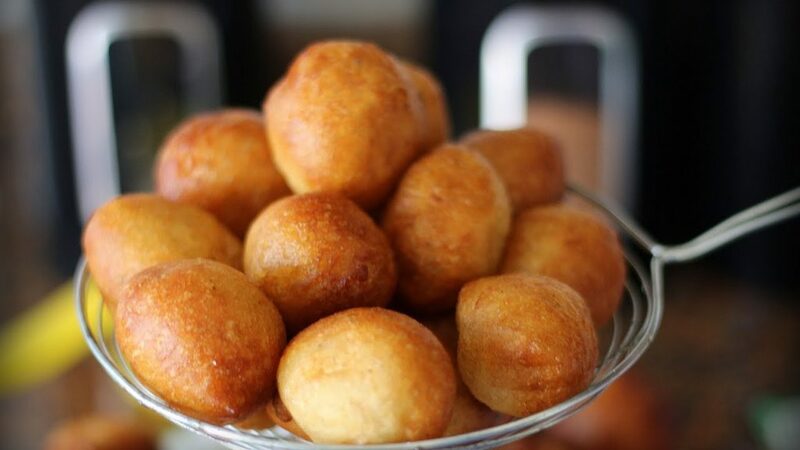 Puff-puffs are made of dough containing flour, yeast, sugar, butter, salt, water and eggs and deep fried in vegetable oil until a golden brown colour. Variations can be made in the recipe by using baking powder in place of yeast but yeast is more common. After frying, puff puffs can be rolled in sugar. Like the French beignet and the Italian zeppole, puff-puffs can be rolled in any spices/flavouring such as cinnamon, vanilla and nutmeg and for a fusion style of cooking puff-puffs served with a fruit dip such as strawberry or raspberry. Puff puff can be taken with juice as lunch. 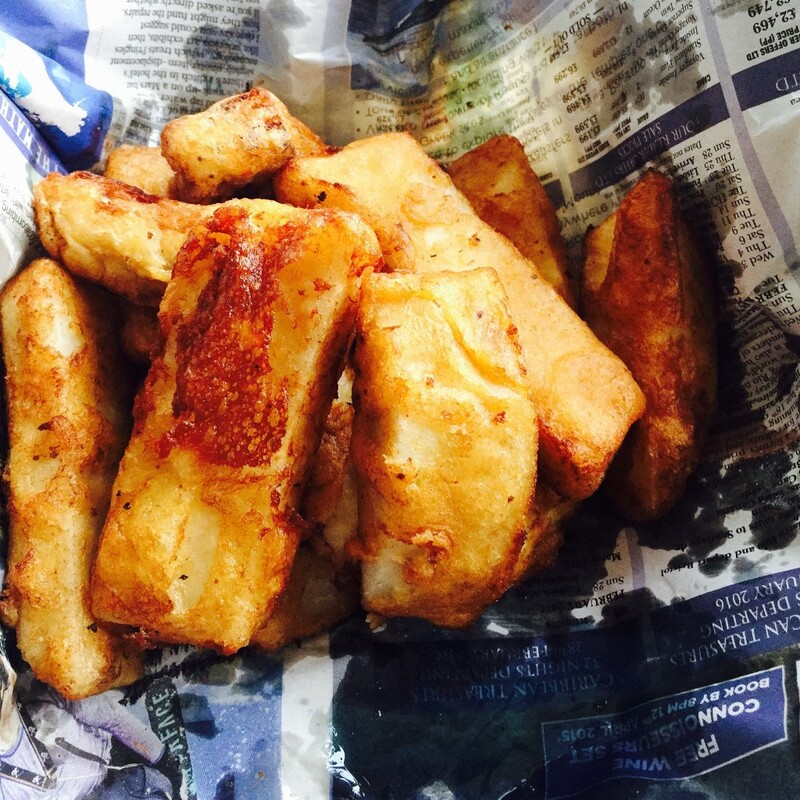 Chin chin is a fried snack popular in West Africa, mostly in Nigeria. It is similar to the Scandinavian snack klenat, a crunchy, donut-like baked or fried dough of wheat flour, and other customary baking items. Chin chin may contain cowpeas. Many people bake it with ground nutmeg for flavor. The dough is usually kneaded and cut into small one-inch (or so) squares, about a quarter of an inch thick, before frying. Banga is a type of palm fruit soup from Southern Nigeria particularly the Urhobo ethnic group. 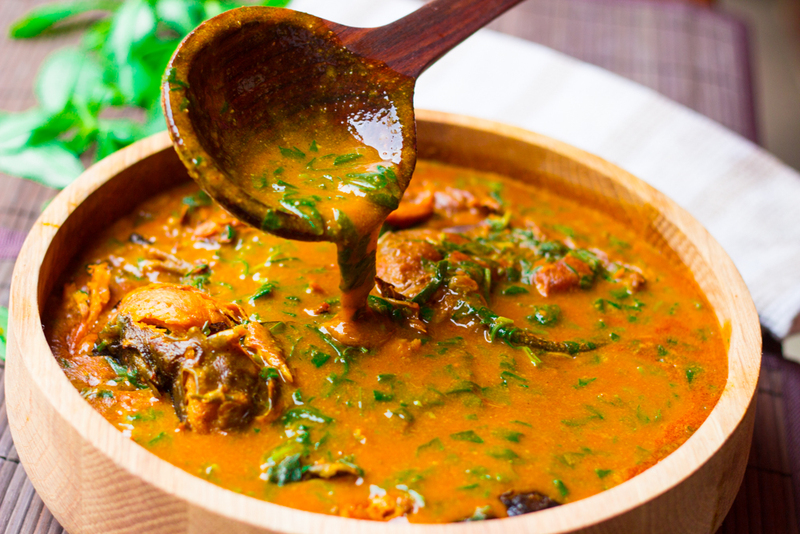 Banga Soup is flavored with Beletete, aidan fruit, rohojie, Banga spice leaves called Obenetietien) (scent or bitter leaves can be substituted),a stick of oburunbebe, finely chopped onion, ground crayfish, chili pepper or scotch bonnet, and salt. The soup is sometimes eaten with a cocoyam (taro) pudding called kwacoco. 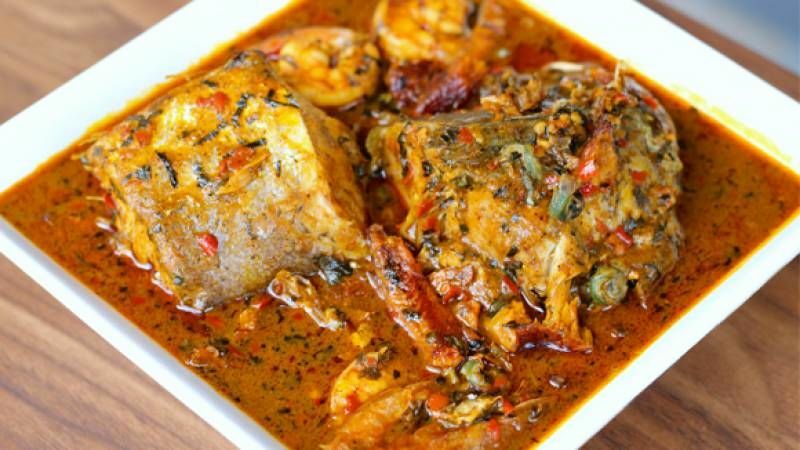 Banga Soup is mostly prepared using fresh catfish (fresh fish Banga soup) dried/smoked fish or meat. The soup can also make a wonderfully delicious dish when made with the addition of Okra (vegetable). Deshelled African land snails, usually cooked in an onion and pepper sauce. 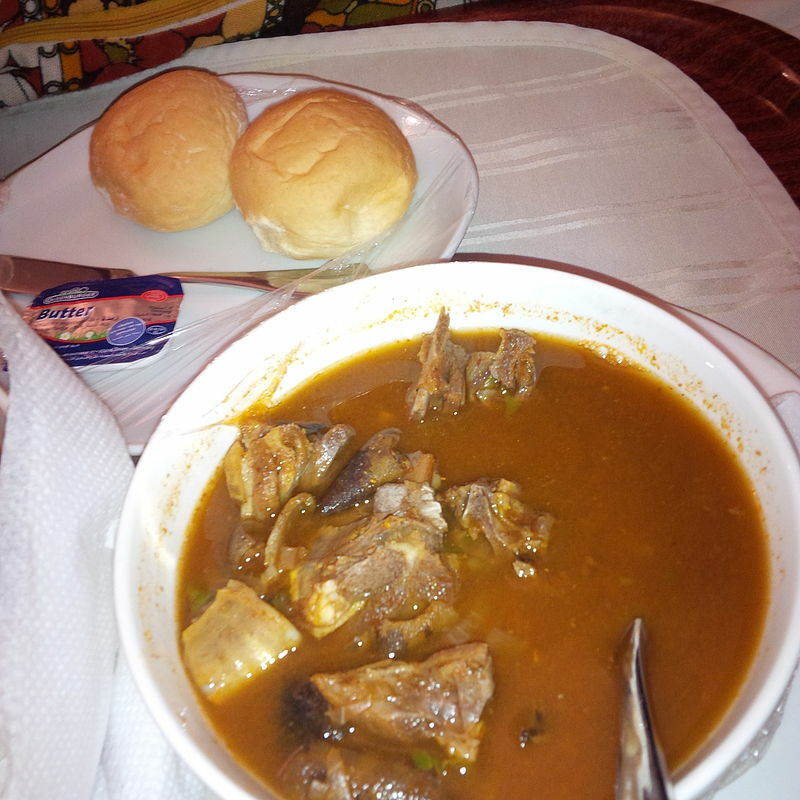 Goat meat pepper soup is a soup in Nigerian cuisine. Goat meat is used as a primary ingredient, and some versions may use crayfish. For variations boiled yams, potatoes, or plantains may be added. Versions of the soup may be spicy and hot. The soup is always served hot and is made with a blend of different spices which gives an intense spiciness and flavor to the soup. The dish has been described as being the most popular out of all the Nigerian pepper soups. It is a light soup that is often prepared without the use of oil and may also be drunk in the style of a beverage.It is sometimes accompanied with eba, rice or pounded yam. It has been described as pairing well with palm wine and beer. 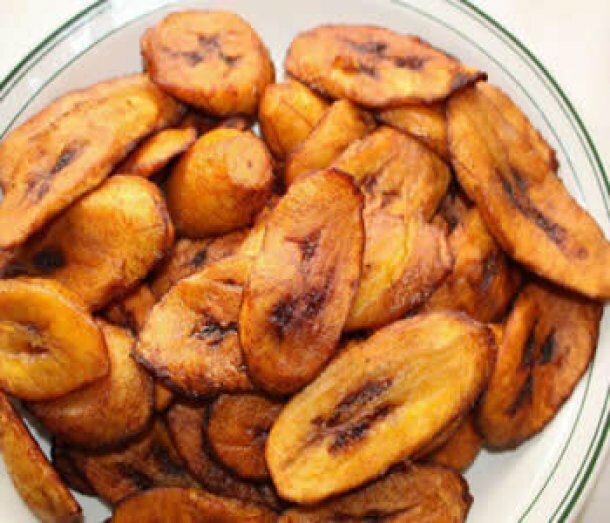 Dodo, or Fried plantain. Great as a starter or side dish, the plantain is flavoured simply with cayenne pepper and a pinch of salt. Ogbono soup is a Nigerian dish made with ground ogbono seeds with considerable local variation. The ground ogbono seeds are used as a thickener, and give the soup a black coloration. Besides seeds, water and palm oil, it typically contains meat, seasonings such as chili pepper, leaf vegetables and other vegetables. Typical leaf vegetables include bitterleaf and celosia. Typical other vegetables include tomatoes and okra. Typical seasonings include chiles, onions, and iru (fermented locust beans). Typical meats include beef, goat, fish, chicken, bush meat, shrimp, or crayfish. 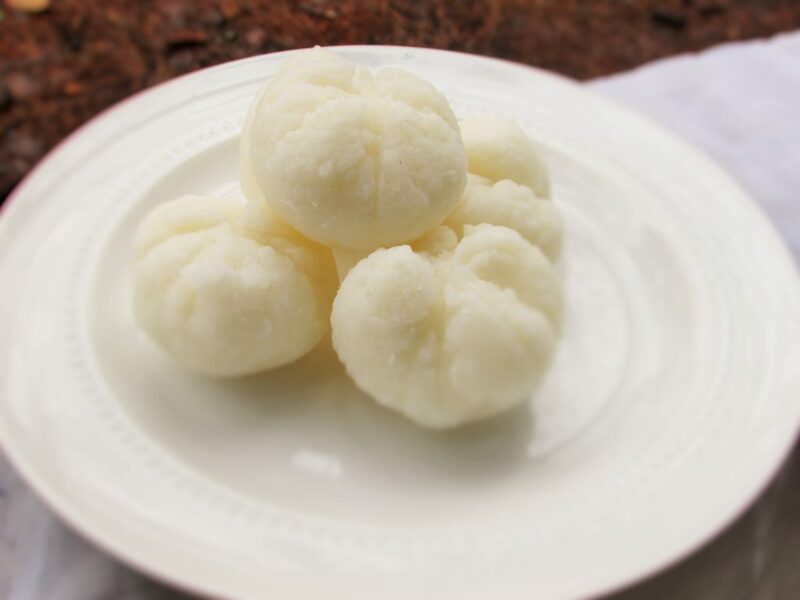 It can be eaten with fufu, pounded yam, or with rice. In other countries the soup may be available in packaged prepared form in some markets that specialize in Western African foods. Ogbono soup has a mucilaginous (slimy) texture, similar to okra soup. 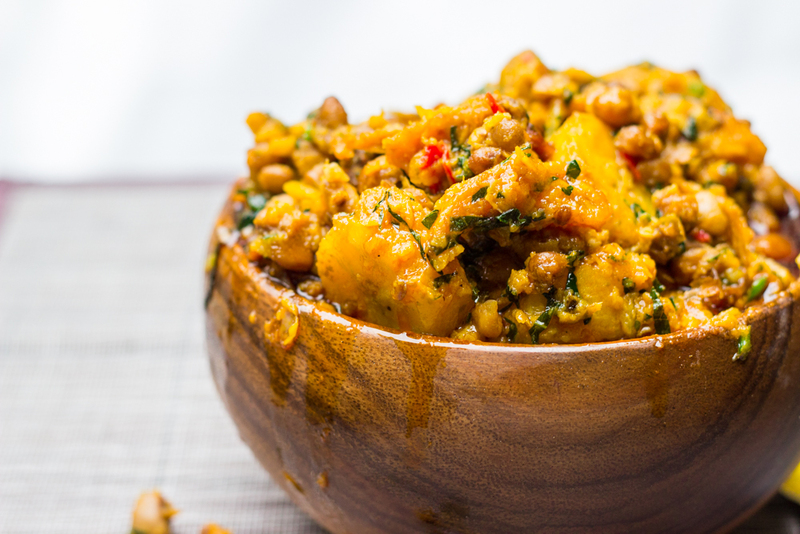 Nigerian Beans and Plantain Pottage is a kid-friendly, sweet and nutritious meal especially for lunch and dinner. Top 27 Egyptian Food - what to eat in Egypt? Ethiopian food & cuisine - what to eat in Ethiopia?